Everything that we need at competition, which includes the pit, was packed and prepared for being shipped to St. Louis. We worked on some hood geometry and started to look at the placement of the hanger tube and different sizes. We also finished the design of the new hood and CNCed the new hood plates. We laser-cut a new center divider for the hood. Everything was assembled at on Monday’s build. 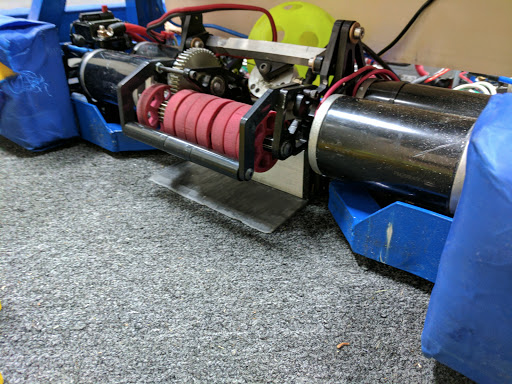 The old hopper broke on the practice bot, so we laser cut new plates and assembled them onto the robot. We also cut spare hopper plates and spare intake ramps in case we need them during champs. We started practicing a new kind of gear cycle called the check mark cycle, which we plan will probably use from here on out. Today, we worked on shooter tuning and semi-automated gear placement in teleop using an ultrasonic sensor. For shooter tuning, we worked on fixing a problem where our stream will begin to walk backwards over long periods of time. We believe this is a result of the system becoming more efficient over time as the bearings on our flywheel heat up. To solve this problem, we tried compensating for the increased flywheel speed over time by taking an average speed of the flywheel between shots and using it to adjust our voltage.. For teleop gear placement, we tried to use the ultrasonic sensor to limit the amount the robot can drive backwards when scoring gears to prevent it from driving too far back and bending the spring. However, we found that the ultrasonic sensor updates far too slowly for this to actually work right now, so we are investigating ways to speed up the ultrasonic sensor and use our drivebase encoders to compensate for this lag. Today we worked on the Cow Catcher, or an assembly that prevents balls from getting stuck in the Gear Grabber and pushes balls out of the way. We began with prototyping with two delrin side plates and a 3/8" standoff, and while the results were promising, balls still got caught in the general vicinity, affecting its performance. To solve this issue, we prototyped the cow catcher with a longer standoff, which prevented balls from getting caught. Having determined the relative effectiveness of the Gear Grabber, we began to design a deployment mechanism such that the cow catcher fits in the framer perimeter at the start of the match. We came up with the use of a torsion spring and hardstop to deploy the cow catcher at the start of the match. Due to the limited availability of springs at the lab, we used rubber bands instead, but the deployable cow catcher was ultimately too weak. Thus, we added standoffs and reinforcing plates to increase rigidity. 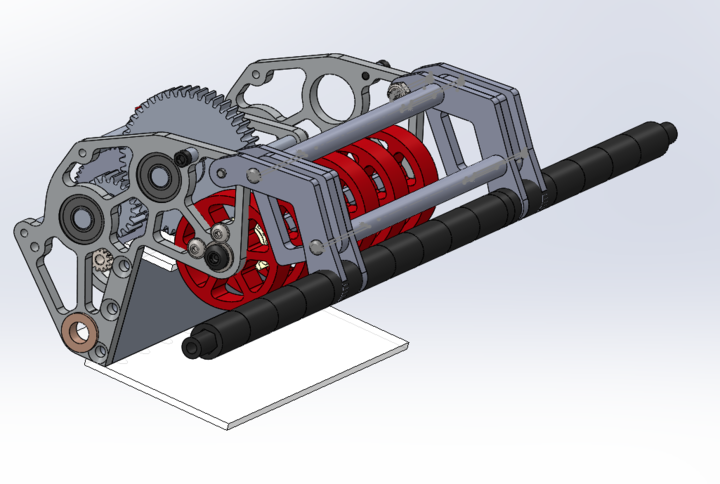 We worked on fixing up our practice bot, making a new intake ramp and straightening out our hopper flanges. We also did a lot of shooter testing and were able to significantly improve the accuracy of our shots. 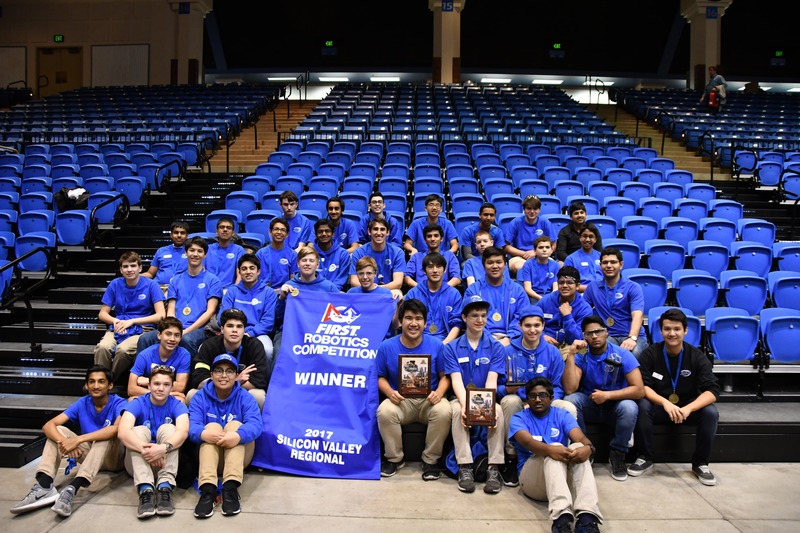 This past weekend, we competed at the Silicon Valley Regional at San Jose State University. 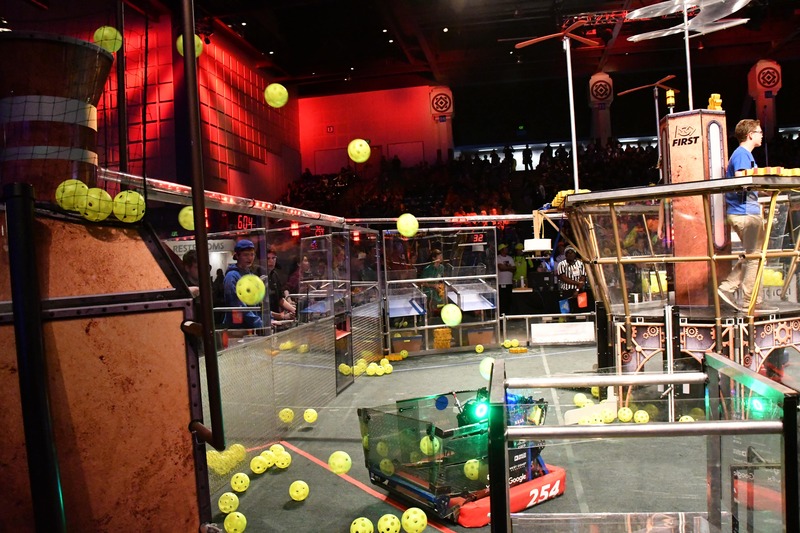 In our alliance, we picked Team 604 “Quixilver Robotics” and Team 4990 “Gryphon Robotics.” With this alliance, we aimed to focus both on fuel and gears, hoping to reach 40kPa+ in the boiler, 4 rotors spinning, and all robots hanging in an ideal game. 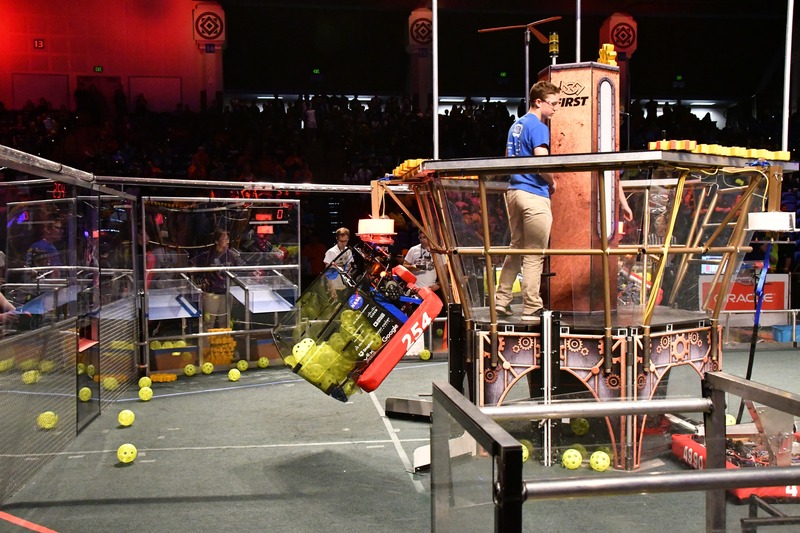 During quarterfinals, we beat the prior record of 506 points with no penalties by scoring 507 points and later in semifinals we scored 509 points.  During finals we finished off with scoring 522 points (517 without penalties)! Through the eliminations, we ended up winning the tournament after an exciting final match! We won the Quality Award and were recognized for being captain of the winning alliance. It was a great experience playing against all these teams and we hope to see some of them again at World Championships in St. Louis.